Wellfleet Bay Wildlife Sanctuary is not only a perfect place for Pine Warblers to breed in the spring; it is also the ideal place to study them. The grove of low pitch pines around the campground hosts a dense breeding population of Pine Warblers, and their behavior can easily be observed thanks to the low canopy, open understory and well-managed habitat. 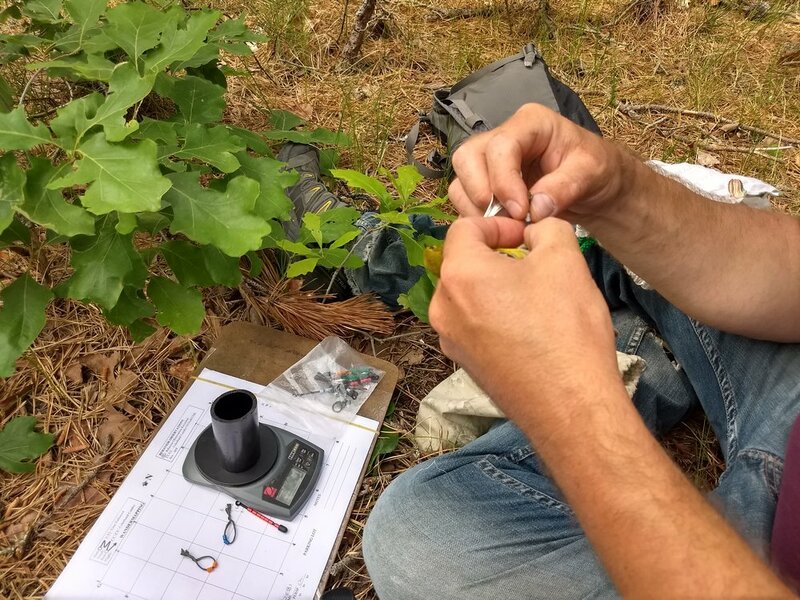 In spring 2018, we marked male Pine Warblers with unique combos of color bands and observed them over a few weeks to estimate the range and extent of their territories. We also recorded details on their foraging behaviors, territorial displays, and nestling feeding. The result was a wealth of observations and a reliable map of the 15 males' territories. We encourage visitors to the sanctuary and guests in the campgrounds to be on the lookout for these valuable colorbanded Pine Warblers, and we look forward to repeating the study each year to learn more about their return rate, territory selection and behavior.